Mikel Maron has a cool visualization of the Blogosphere. 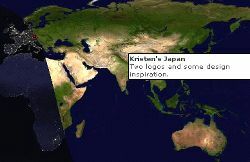 You see on the world map in real time what people post on their weblogs. Is it really real time? Anyway, very neat with a different perspective like that. I am fond of global displays. That's how I'd like to get all sorts of information. A display of the world that you can then drill into, to look closer at different parts. Financial Times via Synergetic Earth News about the confusion over who controls Iraq's oil ministry. The director general said he was confused by the lack of any formal notices, and had a only a vague idea of the committee, backed by the Iraqi National Congress, the formerly exiled opposition group. "I don't honestly know who they are, who chose them, how they are being motivated. I know I am in contact with no one and no one is in contact with me." However, he lamented the whole US approach to dealing with post-war Iraq. "We have a lot of experience with coups d'etat and this one is the worst," he said. "Any colonel in the Iraqi army will tell you that when he does a coup he goes to the broadcasting station with five announcements. "The first one is long live this, down with that. The second one is your new government is this and that. The third is the list of the people to go on retirement. The fourth one, every other official is to report back to work tomorrow morning. The fifth is the curfew." This is usually done within one hour, he added. "Now we are waiting more than a week and still we hear nothing from them." Yeah, it is a bit of problem when you engineer a coup in another country, but you're trying to pretend that you didn't. Or maybe rather that you brought down the government in that country, and you destroyed its infrastructure, and now you're bringing in a few expats who you think you can groom to run the country instead, but you're still trying to pretend you're not the new government.